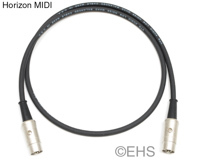 This is our custom-built high-grade MIDI cable, Horizon MIDI series. Construction is Rean 5 PIN DIN connectors with Horizon MIDI.K cable. Rean connectors are some of the best connectors around. Horizon MIDI cable is very flexible, durable, light-weight cable. It is a 4 conductor shielded cable, so we connect all 5 pins, unlike some cheap MIDI cables.